After a long, messy saga that included federal loans, hurricanes, fires, and taxpayers being out $139 million, Fisker Automotive finally declared bankruptcy in November. The good news is that Fisker executives were still doing great, right up until the end, even though no new cars had been built since 2012. After all, since they stopped building cars in Nov. 2012, Fisker had to do something with the $192 million they received from taxpayers in the form of an Advanced Vehicle Technology Manufacturing loan. And that "something" was pay their executives. To do what, exactly, seems up in the air. Fisker's recently-publicized Chapter 11 bankruptcy filing offers quite a bit of insight into the sad, strange state of affairs at the company before it finally closed up shop last month. For example, they only pulled in $8.6 million in income this year up to Oct. 31 — and that's income, not profit. In 2012, Fisker did much better, bringing in $170 million. Times were tough at the company towards the end, but the folks at the top were doing just fine, thanks for asking. According to the bankruptcy filing, co-founder and COO Bernhard Koehler was paid $687,691 over the last year for salary, benefits and reimbursed expenses, as well as $53,625 as a "consultant" between September and November of this year. It's not clear why Koehler was paid twice. Tony Posawatz, the former Chevrolet Volt chief who served as Fisker CEO until he stepped down in April after nine months, he pulled in $534,213 over the last year. And as for Henrik Fisker himself, who left in March amid a dust-up with the rest of management, he made about $330,000 in salary, benefits and expenses in those two years. In total, payments to insiders equal around $4.5 million in about a year. To be fair, Fisker's executives definitely weren't as highly paid as those from larger automakers, who can rake in millions of dollars each year. But it's definitely surprising how much they were paid considering the company hasn't made any new cars in a year. 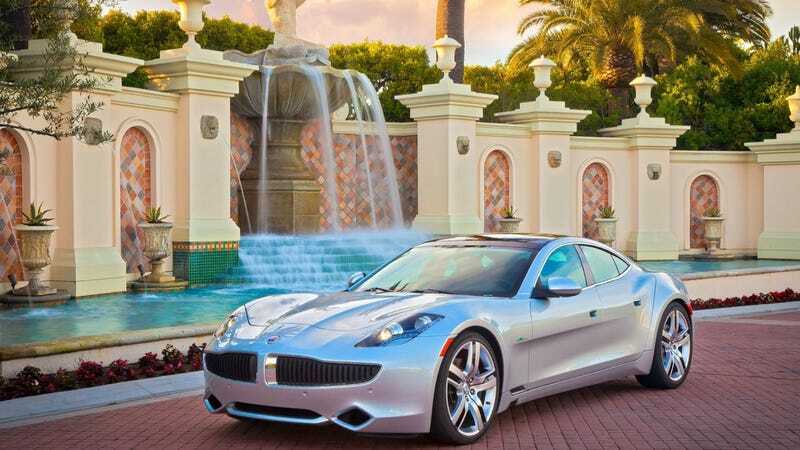 Fisker listed assets of as much as $500 million and debt of as much as $1 billion in their Chapter 11 petition. The bankruptcy has other details we're already familiar with. Fisker listed net losses of $26.8 million for the more than 300 cars destroyed in Hurricane Sandy. Most of the Karmas were in the $90,000 range; their insurance only covered about $4.8 million. One surprise was pointed out by the website Inside EVs: that excluding those 338 Karmas, there are as many as 562 more that remain unaccounted for. Where are they? It's possible they could be piled up somewhere in Europe, possibly in Finland, where the Karma was built by Valmet. Fisker was supposed to build their smaller sedan, the Atlantic, in Delaware, but that never happened. It's tough to say what will happen to Fisker next, especially since they're on the verge of being purchased. The company's assets — including the $139 million it owes taxpayers under its ATVM program loan — are in the process of being bought up by Richard Li's Hybrid Tech LLC. That sale could be finalized as early as January. Who knows. Maybe the Karma will get a second chance. More importantly, maybe the government loans will be paid back.